Bridget Keown from RT Book Reviews gave it a 4.5 start Top Pick and said: Arthur’s boundless imagination reaches new heights in the opening to her new paranormal Souls of Fire series. One of the main attractions is the remarkably strong, world-weary yet indomitable heroine and her fascinating personal history, but Arthur’s supporting cast is as varied, unique and engaging as any she has produced to date. The somewhat atypical romantic intrigue highlights the heartache along with the triumphs that come with being unique and powerful. Fans and new readers alike should take note of this series and experience what might be some of Arthur’s best work to date. 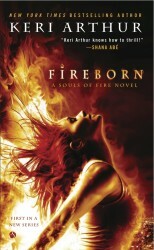 Carmel from Rabid Reads said:FIREBORN is book one in a red hot new series that’s destined to become an Urban Fantasy favourite; if you’re tired of the same ol’, then look no further than Keri Arthur’s SOULS OF FIRE. Amber R from Awesome Sauce Book Club said: With the plot, the characters, the steaminess, and the rhythm of the writing this series is bound to be a hit. The ending cleaned up the loose ends pretty tidily but leaves some threads hanging that leave us immediately wanting to know more. And don’t worry Keri’s talent for steaming up the pages is definitely in there as well. A book that is sure to catch the interests of anyone who loves suspense, romance, perseverance, and heartbreak with a paranormal twist Fireborn does not disappoint. Jen from Tyngas’s Reviews said: If you’re looking to start a new urban fantasy series with a compelling plot, fully realised characters, steamy romance, and standout worldbuilding, look no further than FIREBORN. Keri Arthur has kicked off what’s sure to be yet another amazing series and you won’t be sorry you’ve given it a shot!